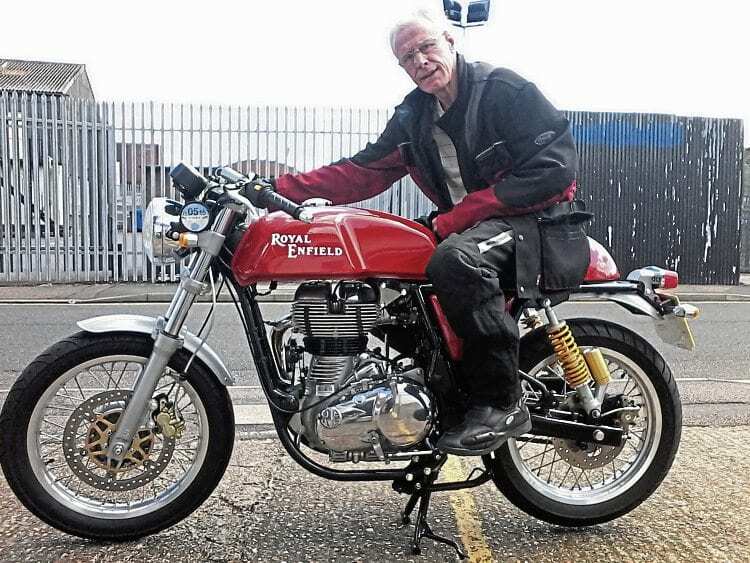 At 74, Albert Jones from Farnborough is still enjoying riding, café racer-style. Here he tells of his experiences with a Royal Enfield 535 Continental GT. A café racer fan all his life, Albert looks ready to go. After riding café racers for many years, and having being keen on road racing ever since my parents took me to the Isle of Man in the early 1950s, I returned to motorcycling after a long lay-off when I retired and bought a silver 500cc Royal Enfield Electra Sportsman. it wasn’t that reliable and I had many breakdowns, so I part-exchanged it for a 535 Continental GT from Corsa Italiana in Hersham on September 1, 2014. I have found it to be a far superior bike, with a Harris twin downtube frame and disc brakes that really stop you, and in just over two years I’ve covered 11,500 miles on it. One oil change does the engine, primary chain and gearbox, and now that the two-year warranty period has ended, I do all the servicing myself. The items changed under warranty were a front brake disc, two rubber oil seals on the kick-start shaft and an ignition switch. I’m now on the second set of tyres and a new drive chain. I didn’t get on with the original tyres and had two small accidents, thankfully with little damage to the ike and myself, and no insurance claims have been made. Previous Post:What happened to the Roamer?